I flew to Porto from Madrid for a weekend and it only cost me €26 for a round trip flight and €16 for two nights at a clean and beautiful place called Oporto City Hostel (check them out on Google Maps here) which we booked through Hostel World! You can definitely travel on a budget but it takes months of research, preparation, and luck! I search for random flights across Europe during my free time and since I had yet to go out of the country last November 2017, Porto was on the top of my list of European cities to visit. I went on the Explore Map feature on Google Flights as well as Kayak to see if there were any affordable round trip flights from Madrid. Google Flights has a feature to see an overview of airfares from your location to different parts of of the world. I saw that Portugal had promo fares so I logged on to Kayak and confirmed that there were round trip flights to Porto in January 2018 for only €26! My flatmate and I had been wanting to go to Porto for over 3 years and we booked them right after checking Hostel World if accommodation would be just as affordable. We lucked out and found surprisingly affordable rooms at a hostel with high reviews! The price per night in a mixed bedroom at Oporto City Hostel was only €8 for each person per night! We took a chance on the hostel because they have good reviews on Hostel World (8.2/10 on Hostel World and 4.5/5 out of 143 reviews on Google Maps) plus my flat mate and I are easy to please. Our flight to Porto was at 9:20 AM. From Puerta del Sol we took the Cercanías to Nuevos Ministerios, changed to line 8 to Madrid-Barajas Airport Terminal 1. We arrived Porto at 9:40 AM (note that there is a time difference) and then we took the Metro to Trindade where Oporto City Hostel is located. The Andante (metro) card cost us €2,60; €2 for the trip from the airport to Trindade and €,60 for the card. We arrived at Trindade and followed the directions given to us by the hostel. Check-in was still at 3 PM so we left our luggage before heading out to eat. We walked to the Chapel of Souls located on Rua de Santa Catarina. The Chapel of Souls is a beautiful chapel famous for its tiled exterior. We then walked to Bolhão Market where they sell vegetables, seafood, and souvenirs. 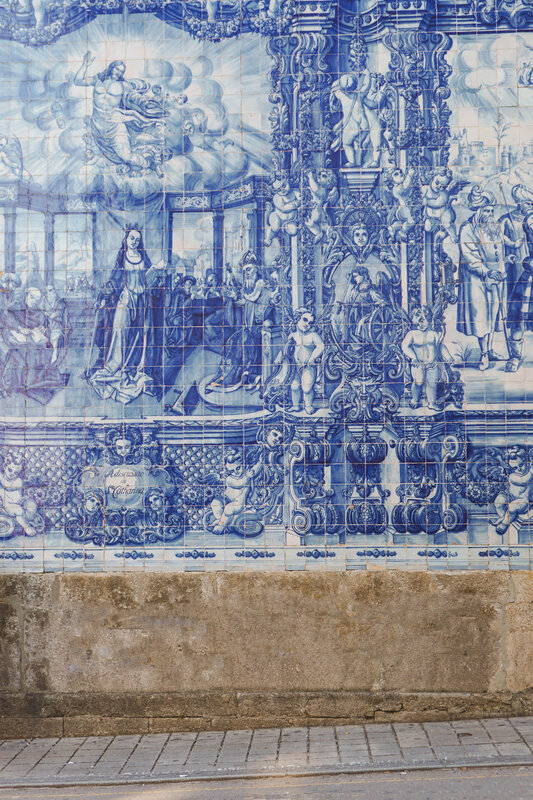 There was an area that sold a lot of tile products that Portugal is known for. We went back the next day so I could buy 2 beautiful tiled trays as well as a tiled box for my mother. Some trays cost €12 and the others were €15. If you love Portugal’s cork and tile products like trays, chopping boards and the like, you should go to the market! The prices aren’t bad either, you're bound to find good deals. After the Bolhão Market, my flatmate Julian brought us to Café Santiago to try Francesinhas. If you’re on a budget and want to try Porto’s specialty, head to Café Santiago because their food isn't as expensive as compared to the tourist areas (like restaurants near the Douro River). One Francesinha costs 9-10 euros and in places where tourists often flock cost 10-15 euros. It was was a meal my friend and I had to split because it was too big. For coffee and dessert, we went to Café Majestic, An Art Deco styled café that dates back to 1921. According to online research, J.K. Rowling spent most of her time at that café and they say that’s where she wrote the first two Harry Potter books. They served afternoon tea (tea + food), but they cost a lot more than any regular café because the place is fancy and on the pricier side. Their selection of dessert cost more than €3 but we were still full from our lunch so Julian just had coffee while I ordered hot chocolate. I enjoyed their hot chocolate! It would’ve been overkill but I think it would have tasted even better if you order it with whipped cream. 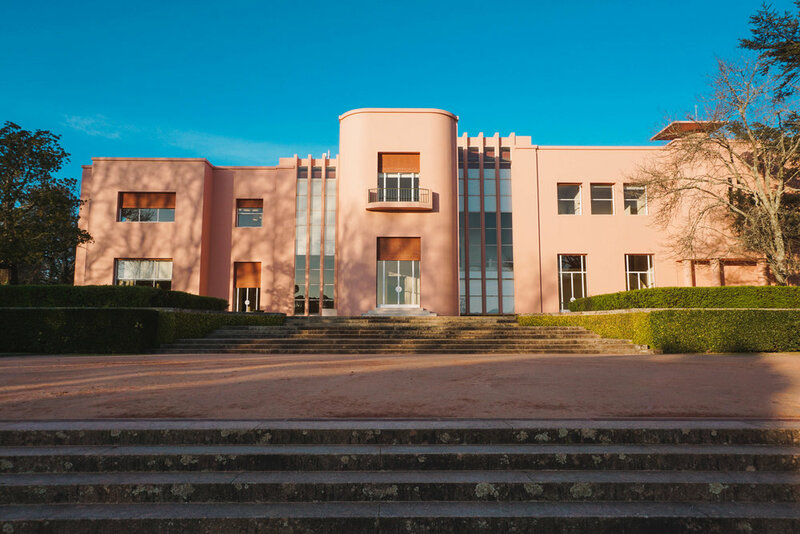 We finished at the café at around 3 PM so we walked back to our hostel to freshen up then headed out again to catch Museu Serralves by sunset. From the Bolhão bus stop, we took bus 502 towards Matosinhos (Mercado) and went down at Gomes da Costa and walked to Museu Serralves, a contemporary art museum, park, and house. The entrance was a single payment of €5. Once we finished at the museum, we rode a bus back to the center and got down at a stop near Clérigos and walked around the area. Since Julian and I were still full from lunch, we split a small bacalao croquette from Casa Portuguesa do Pastel de Bacalhau. 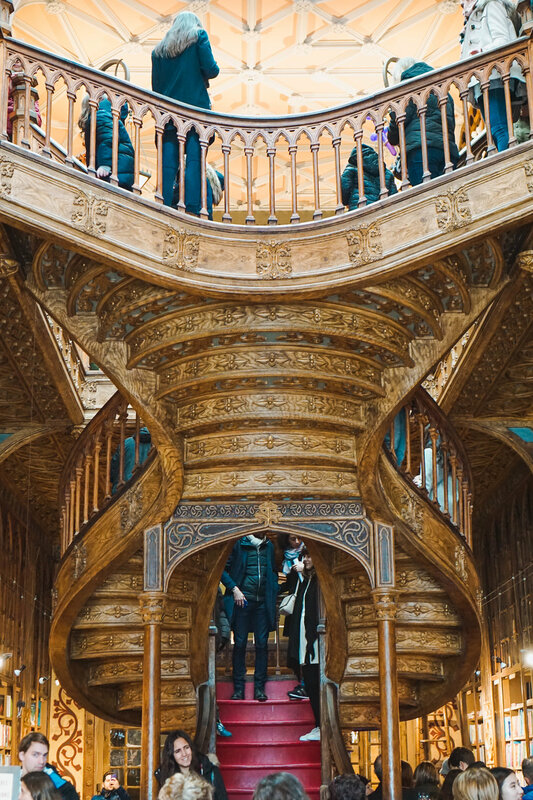 We also went to Livraria Lello and we bought tickets for the next day. I know you can order tickets online but I had been trying for the past 2 months but it would always tell me that purchasing online wasn't available. 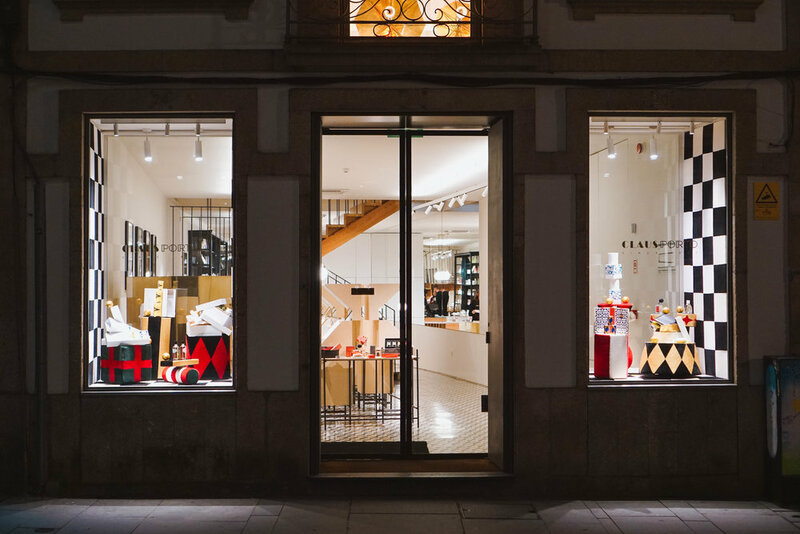 After we bought our tickets we entered A Vida Portuguesa, a home goods store then went to Claus Porto, a store that sells luxury soaps, candles, and the like. After window shopping we made our way down the Ribeira area to check the Douro river at night and had Port Wine nearby. We entered Lello and browsed the books, I wanted to buy some but I decided not to because I still have 2 books waiting to be read. Afterwards we walked down to the Douro River and had lunch at Grupo Desportivo Infante D. Henrique, a random restaurant (with 3.9 stars on Google Maps) we found while walking. It was a decent lunch for the price we paid. *Note that they only accepted cash payments. Had dessert at Cremosi and walked around the Bolhão area again because Julian wanted to shop for soaps. We ended our day with more food and Port Wine at Café Negra, an intimate and modern café with wooden interiors. We had to wake up at 2 AM to catch our 7:30 AM flight back to Madrid (this is what we get for buying cheap flights, no regrets!). We had to take bus 3M from Trindade to Aeroporto at 3:00 AM. We had to go to the airport early because the bus was still on the night schedule so it only came every hour. Tip: Next time, try to figure out your transportation and to see if lacking sleep will be worth it. Overall we enjoyed our trip to Porto! However, we didn't expect Porto to be so quiet, though! The streets weren't full of people, which was also a good thing because it was not crowded at all. We're so glad we were able to pay €42 for our round trip flight and accommodation! Budget trips can definitely happen as long as you plan ahead of time. It can get difficult when you're not aware of your schedule so you should just hope for the best when you decide to book 3-4 months in advance. It's possible to see Porto in a day and a half. We were able to do it during the winter season where days are shorter. If you plan to go in the spring or summer where days are longer and if you want to hit all the tourist spots, plan strategically and a weekend will be enough! Portugal is a good country to go to if you're on a budget and there's so much to see. Just walking around the city is a treat in itself because of the beautiful tiles! My friend and I adore Portugal because their branding and designing are always on point, no matter where you look, may it just be a small time café, you can bet that their branding is modern and pleasing to the eye. Their design game is on point and it's a force to be reckoned with. Accommodation: €8 per night, €16 total per head.